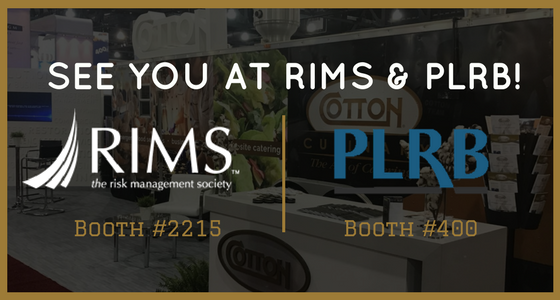 Cotton Displays National Presence April 15-18th - Cotton Holdings Inc.
On April 15-18th the Cotton Team is in San Antonio, Texas for the 2018 Annual RIMS Conference and also to Orlando, Florida for the 2018 PLRB Claims Conference & Insurance Services Expo. The Cotton Team’s national presence will simultaneously be on full display this week, and we couldn’t be more thrilled to showcase our capabilities and achievements, while networking with others in the industry. Cotton is pleased to announce our sponsorship with the 2018 Annual RIMS Conference. The Annual Conference is the premier event for the risk community and those involved within the same vertical to come together to learn and network. Stop by the Cotton booth (#2215) to learn more about Cotton’s international expansion and building a successful Business Continuity Plan. Not only will Cotton be exhibiting for another year but Cotton's EVP of Global Risk Management and former RIMS President, Lance J. Ewing, will speak at three sessions this year! “Hospitality Industry Session: You Can Check Out Anytime You Want but You Can Never Leave"
The Cotton Team is excited to be in Orlando to promote our brand while also learning from industry insiders at the 2018 PLRB Claims Conference & Insurance Services Expo. Stop by our booth (#400) in between sessions to learn more about Cotton’s diverse suite of property & business continuity solutions! Whether it’s San Antonio or Orlando, the Cotton Team is looking forward to seeing you!